So I primarily tuned into Trackside with Kevin & Cavin yesterday to hear what exactly was goin’ on with the Sam Schmidt TAKEOVER, Err Merger with FAZZT Race Team. Hey! I’m happy that ‘TAG (Alex Tagliani) will remain upon the grid this year – thus I was looking forward to the Sam Schmidt interview, which unfortunately didn’t happen... Hmm? Apparently either Kurty or Sam get their TS Steele timepieces serviced by the same watchmaker as Jay ‘Funnyman Howard; Hya! As Jay’s been prone to having trouble to setting his watch correctly; although I’ve never ever made a time conversion error here at No Fenders, right? Thus I was surprised to learn that Dreyer & Reinbold officially announced Ana ‘Bia “Figarito” Beatriz as Justin ‘BIG UNIT Wilson’s teammate in the No. 24 previously occupied by Mike Conway. Beatriz brings Brazilian Oil sponsorship a la Milkalicious’s CITGO deal in the form of Ipiranga for a full season gig at D & R.
In another story vacillating in that Uber-nebulous NoFenderz WormHole - I believe that Bia’s manager is none other then André Ribeiro, Whom you may recall won 3-races in CART between 1995-96 – all for Tasman Motorsports... Before first driving and then working for The Captain, nee Roger Penske; ironically, whilst doing some research for a long overdue project, I accidentally came upon the name Alex Dias Ribeiro, who briefly dabbled as a Gran Primo Piloto way back yonder in the late-1970’s – ultimately finishing his career failing to qualify a second entry for an outfit called Fittipaldi Automotive, albeit having participated in 20 Grand Prix’s. Yet the elder Ribeiro (Alex Dias) seems to have expended his 15-minutes ‘O fame in his latter driving career upon returning to Formula One as its Medical Safety Car driver in 1999. Unfortunately he first crashed said Medic’s car during the Monaco GP weekend – which resulted in Professor Sid Watkins suffering three broken ribs! Then in 2002, no less than the Brazilian GP, he made the dubious mistake of leaving his door ajar just in the Nick ‘O time for some German chap named Heidfeld to collect it with his hurtlin’ Sauber racecar; causing Heidfeld to do an impromptu rendition of John Hyatt’s Smashing A Perfectly Good Racecar, Err Guitar; YIKES! But back to the women of IndyCar, as this now brings us to three fulltime Femme Fatales on the 2011 IndyCar dockets, whilst speculation swirls around a possible return by Katherine Legge, with Pippa Mann, who’s just tested at Texas for Eric Bachelart – her debutant INDYCAR outing, sounding very GEEKED ‘bout putting some sorta OvalTrack program together... Specifically shooting for the 2011 OvaltteenCup Trophy – Sheesh! Sounds like every gal ‘cept Milka Duno’s coming outta the woodwork in order to run in the Big Carz, eh? Although I still suggest its worth reading Paul diatlovich’s comments ‘bout Pippa & ‘Bia’s talent vs. the Original Swiss Miss Cyndie Allemann in; An Interview with Paul Diatlovich. 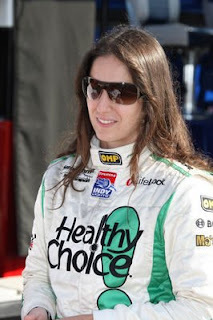 And don’t forget ‘bout Milka Duno, who’s reputedly still cleared by IndyCar to run upon Ovals; Hmm? A third Dale Coyne entry at Indy this May?